Although we have had a week with some good moments, Kate has been unusually discouraged. In her words, “frustrated.” Leaving her purse at 2 restaurants last weekend, losing her tickets to the symphony concert last week (something I hadn’t mentioned before), and auto accident were the key incidents. In addition, however, she has had great difficulty working on the computer. Specifically, she has been working on a Christmas eCard to send to our friends. She has selected a variety of pictures taken since the early days of our marriage up to the present time; however, she keeps revising and makes new mistakes each time she makes a change. Her discouragement is reflected in a withdrawal. She has been playing Free Cell on the computer and is doing nothing that I can see to prepare for our departure in the morning at 9:30 for the airport for our flight to San Antonio. For me one of the most disturbing aspects of this withdrawal is a withdrawal from me as well. Normally, she seeks me for comfort. In this case, she is simply withdrawing and rather uncommunicative. I have tried to be supportive, but she is not too responsive. I should say, however, that before we went to church this morning she gave me a big hug and said something that conveyed how dependent she is on me. The week’s events have left me discouraged as well. It is a little the way I felt with Dad when he was having a bad day. A bad day for him was a bad day for me. So how are we feeling today? Today is the 52nd anniversary of our first date and the 51st anniversary of our engagement. We normally do more reflecting on those occasions than we are today. Perhaps I should say that we have acknowledged the occasions; however, our mood is somber rather than joyous. Kate continues to be down as a result of her accident. She said she was feeling better this morning. Then we received a call from the State Farm adjuster who asked questions about the accident. I still hadn’t been able to learn who has(d) our car. While at lunch I got a call from the officer who was at the scene of the accident. She gave me the correct name, address, and phone number of the garage that was holding the car. I have now arranged for it to be towed to the same body shop that has previously done work for us. All this activity has brought back Kate’s feelings of inadequacy. On top of the accident, Kate has left her purse with her cell phone at 2 different restaurants over the weekend. The first was on Saturday. We had lunch near my office. We realized sometime later than she did not have her cell phone but couldn’t figure out where it might be. At almost 3:00 am Sunday morning, I got a text message saying it had been found at deli where we had had lunch. After church on Sunday we went by to pick it up. That afternoon we attended a Christmas concert given by the Nashville Symphony. We went with a group of Kate’s PEO sisters and some spouses. After the concert we went to dinner. On Monday we realized that Kate’s phone was missing. I called it a number of times while I looked in the car, in her closet, in our bedroom as well as other bedrooms in the house. We simply didn’t know where it was until I received a call yesterday (Wednesday) afternoon. It was the manager of the restaurant where we had dinner saying she had the purse and phone. I told her we would come out today to get it. That took us to there for lunch, and we recovered the missing items. I have needed to watch for Kate’s purse for a long time, but it just isn’t in my sphere of concern. I need to change and am committed to doing so. Now the real issue – how am I doing? I would say that I am anxious. Seeing the decline in Kate saddens me. 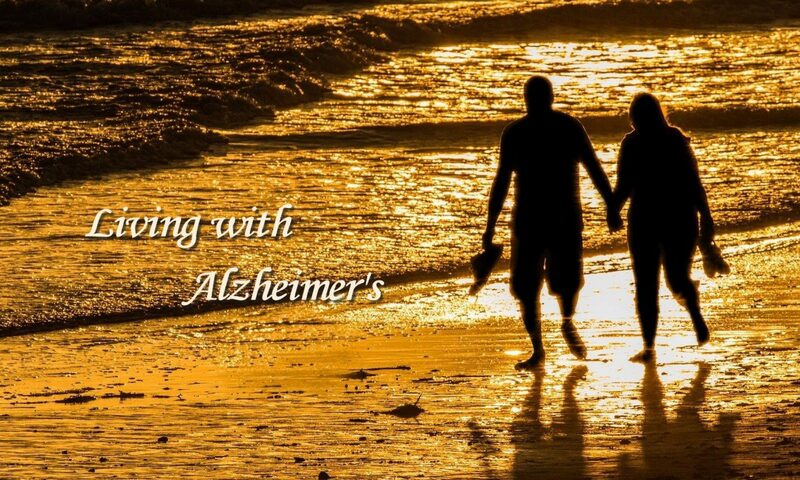 It makes me wonder how long we have before it is clear to everyone that she has Alzheimer’s. Already it has seriously affected our conversations. She is unable to express much interest, only toleration, for things I have to say. Often, it is obvious that she doesn’t want to go on with a conversation. We connect best when we reminisce about the experiences we have over our years together. We both enjoyed reflecting on the people we have known, the places we have been, etc. It is difficult to engage in much other conversation. I am beginning to accept longer periods of silence which is something that a person with my personality has trouble with. On Sunday Kate went to the church library while I went to my SS class. After class I went to pick her up for the worship service. When we began to walk to the sanctuary, I could tell Kate was down and not so interested in going to church. I asked if she would like to skip today and go directly to lunch. She said, “Yes” and breathed a sigh of relief. On the way to lunch, I told her I would not get her into a discussion but I wanted her to know that I saw her frustration and recognized that she doesn’t like to talk about her problem(s) but that I also felt I had to say I want to help her. She acknowledged that I was right and said, “I am feeling more frustration.” We didn’t discuss anything more, but I did ask her if she felt we were at the time to tell the children. She gave a strong no. Yesterday afternoon I dropped by the church to pick up a DVD from one of our church staff. I saw several people and one of our associate pastors, invited me into her office. She offered to help me in any way if I wanted anything. This was the second time she has offered which confirmed that our senior pastor had told her about Kate. I suspect this means that all of the pastors are aware of the situation. We had a good, though brief, conversation about the situation. I told her I was struggling with whether or not to tell the children and that I thought we were getting to that point even if Kate does not. After I got home, Kate received a phone call from her hairdresser who said she had left a message that she could take Kate for a 3:30 appointment. Kate had not checked messages; so she didn’t know. It was 3:40; so I offered to take her to the appointment. After picking her up, she volunteered that she thought she had reached a new level. I told her I agreed. She noted that it was not a dramatic, but a gradual change that has occurred. I agreed with that. I have been increasingly worried about her driving. After picking her up, I had to leave for a meeting at a law firm at 5:30. She told me she planned to go to a Mexican restaurant near our house for dinner and leave at the same time I did. I told her I would feel better if she went to Panera. It’s even closer. She suggested she would be all right. When I got out of my meeting, I looked at my phone and saw that I had a couple of voicemails, one of which was from Kate. I quickly listened to it. She told me she was back home and all right. Then she conveyed information that let me know she had been in an accident. It turns out that she was presuming that I had listened to an earlier message from a number I did not recognize. That was a call from the police officer who was at the scene, gave her a ticket for running a red light, and took her home. I am also realizing that her behavior sense Dad’s death is not entirely part of our grief. The weather has changed, the party is over, and she is not spending a good part of the day pruning. That was a major activity before the party. Thus she is left with little that she is able to do, but play Free Cell on her computer. This has led me to go back to my thinking about telling the children about things after Christmas. We just got back from Ellen Seacrest’s house where we had lunch with several other friends. Kate is taking a short nap before we head to a movie; so I thought I might make an observation or two on our current state. All-in-all I think we are making slow but steady progress in our recovery. Surprisingly, I think Kate is having a harder time adjusting than I. I think that is due mostly to the fact that I have had a number of responsibilities with the foundation, music club, and Sunday school that have kept me busier. Kate commented yesterday that she is finding herself not having anything to do. We have both talked about pursuing some kind of volunteer work. I have even gotten the name of a contact at one of our hospitals. I will contact her after the first of the year. I mentioned several different things I thought we might do, and working with children was the one Kate liked most. I notice that Kate is spending much of her time playing Free Cell on her computer. I think that is because so many other things frustrate her. Also the weather has been colder. That makes it more difficult to be outside pruning the plants. We went to New York last week and had a great time, but we can’t always be doing special things. Beginning now I need to make more effort to see that she is occupied in worthwhile/pleasurable activities. Otherwise, she will just vegetate. She can’t seem to focus on anything for any length of time. She started decorating the house for Christmas. I thought that was a good idea, but she stopped with garlands of greenery thrown on the floor or across the furniture. Her short term memory is clearly getting worse. I think this is what is going to give her condition away to friends. She is very likely to ask the same question in relatively short time frame. This is beginning to happen a lot. As we were coming home from the Ellen’s, she said she had talked with a man who told her that his wife “has the same thing that I have. What is that?” I told her it was Alzheimer’s. She, of course, remembered immediately. This is a frequent occurrence. Yesterday she asked me to tell her our passcode to listen to our voicemail. This is something she has been using for several years without a problem. Later in the day she had to ask me again. I am struggling about telling the children. I want to honor her desire that they not know, but I feel I have benefitted by knowing. It means I make the most of the time we have together. The children don’t stay in as much contact with her. This is not anything that she even realizes, but I believe she would love it if she heard from them more frequently. Yesterday I had just about made up my mind to tell them before her birthday in January. Today I am more doubtful. I don’t want the grandchildren to know. They might say something to Kate. Then Kate would know that I had betrayed her confidence. As I write this I am feeling like telling them anyway. I have a little time to think and will weigh the pros and cons. Much has happened since Dad’s death and memorial service. Kate and I have both experienced a “letdown” that I consider one of the stages of grief. We haven’t felt sad. In fact, we are pleased with the way Dad left us. He had the birthday that he lived for all year, and when he died, he did so without pain. Despite the good things that we can say about his passing, we have both felt lethargic and just not up to doing things. This has led to our trying to entertain ourselves more than usual. We have been to several movies, several live performances at local theaters, and eaten out at places that are a little more special than we usually do. In addition, I booked a trip to New York. We leave this Tuesday morning and return Friday evening. I would never have considered doing this if Dad were still alive. Now that he is gone, there is no reason that we can’t, and I feel we need it. I should say that I believe we are both at the end of our grieving. We went to Jesse’s for Thanksgiving. On the way back, Kate said she felt she was over her slump. The visit with Jesse’s family had given her a real boost. In many respects I feel the same way except that I find myself waking up at night and not going back to sleep the way I usually do. In most cases, I find my mind wandering to thoughts about Dad. I have been especially anxious to comment on Kate and how she is doing with respect to her Alzheimer’s. I am clearly sensing that she is deteriorating further. It makes me wonder if we are nearing a time when I should let the children know. I will wait on a decision until after our visit with Kevin’s family for Christmas. When the family was here for the Dad’s party and then two weeks later for his memorial service, she did little to help get things done. To some extent, I may have saved her by telling Larry that I didn’t want her to have to do much and welcomed his offers to help. He and other family members came through with food and preparation that helped us tremendously. Of course, Dad’s sister-in-law, as always, was a big help as well. She came a little early before the party and the memorial service just to help. I am seeing so many signs of Kate’s condition that I can’t begin to summarize them here. Things are happening all day, each day. In general, it manifests itself in two ways. First, is a dysfunctional way of addressing all of the numerous tasks that most of us take for granted. One silly one is that she never sufficiently cleans out the yogurt container after eating her yogurt. I come behind her and rinse it further. Similarly, the spoon she uses is rinsed, but she never completely rinses it. She does things like leaving clothes on the floor or hanging them up very sloppily if she hangs them at all. The second indicator is one that people would suspect. Her memory is deteriorating. She simply can’t remember routine things that I tell her. She repeatedly asks me what day we are going to New York or whatever else we are planning to do. I have to stay on top of all obligations, not just for me, but so that she can be prepared. Ironically, she recognizes that she has trouble getting ready to go places and has started working harder to be on time when we are going out. She even feels that she is doing well at this and feels that I don’t trust her enough. We don’t talk a lot about her condition. I try not to do anything to draw attention to it. I let her do the talking. She doesn’t say much, but she does tell me about things she has done or forgotten. I just give her a hug and tell her I love her. She depends more heavily on me than in the past, but she also shows a desire for more independence. She takes pleasure in letting me know when she remembers something she expected me to think she would forget. I was quite concerned about her at Jesse’s for Thanksgiving. She spent a lot of time in the bedroom while I spent time with Jesse and Greg. My own interpretation is that she just can’t carry on a conversation for very long. She is still great at the initial small talk that is part of what we do when we haven’t seen people in a while. After a while, it is too much for her to handle. She has trouble following conversations, movies, plays, etc. The surprise is that when she told me that she thought she was coming out of her slump, I thought she was talking about being in a slump at Jesse’s. When I asked if she meant at Jesse’s, she acted offended and said, “Of course not. I was just fine at Jesse’s. That makes me think she has deteriorated to the point at which she does not recognize how her retiring behavior appears to others. It seems strange. She is simply withdrawing. This is the kind of thing that I would expect most people to notice first before recognizing the memory problem.